Vanilla is Mexico’s gift to the world! Vanilla is the only edible fruit of the orchid. The Totonacs of Veracruz, Mexico are credited as its first cultivators. The Totonacs considered vanilla a sacred herb and used it in ritual offerings, as a perfume and for medicine, but rarely as a flavoring. By the early 1400s, the Aztecs added to the mystique of vanilla by combining it with chocolate. When the Spanish explorer Hernan Cortez first met Emperor Moctezuma, during a religious ceremony, Cortez was offered a very exotic, special and original drink, which was named ""Xocohotl"". The drink was basically Chocolate and Vanilla. It so pleased Cortez that he inquired as to its special original flavor and fragrance; he was told it was Vanilla (Little Sheath) which describes the shape of the Vanilla pod. Cortez was so impressed that he returned to Spain with a supply of Vanilla beans to add this special flavor and fragrance to the palate of the Spanish King.commodity. During that period of time, because of the rarity and extraordinary cost in shipping, it soon became the exclusive beverage of all Aristocrats and Royalty in Europe. 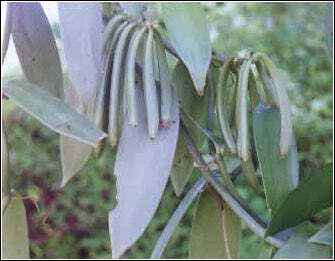 Vanilla, a species of a climbing Orchid, grew beautiful foliage and flowers in each of these regions, but never produced any Vanilla pods. A mystery to the world until 1836, a Frenchman observing very closely the original Vanilla plant, in Mexico, discovered the reason. Each of the orchid blooms was visited by the small ""Melipona"" bee. This specialized little creature provided the pollination which produced the fruit! Only in Mexico is the Melipona Bee found. Methods of curing and drying vary, but in all cases, the enzymatic process in the live beans must be halted to prevent fermenting. This is accomplished through heating in ovens or blanching in hot water. The beans are then placed in the sun each morning for weeks, or sometimes months, before being placed in large wooden boxes and allowed to sweat. the beans will lose nearly 80% of the original moisture content before their more than 250 natural flavor and fragrance components are completely developed. The entire process from pollination to shipment takes about one year. Vanilla is the second most expensive spice (after saffron) due to the extensive labor required to grow, harvest, and cure the vanilla beans.